An already-shod boot aficionado waits on her friends to make their purchases at Big Time Boots on Broadway. The tall, lean young man stands at the intersection of Lower Broadway and Fifth, waiting in the massive Saturday afternoon crowd for his chance to cross from the Tootsie’s side of the street over to the side highlighted by Ernest Tubb Record Shop. Mark Schmitt, 24, from Richmond, Virginia, smiles when asked how he likes his obviously brand-new, un-scuffed cowboy boots. “Got this, too,” he says, tipping his straw cowboy hat. He steps out of the foot traffic for a few minutes while his friends – a half-dozen who so far bought neither boots nor hats – see that he’s stopped, so they and return to this corner to listen to the conversation. Yes, he says they came from Austria, not Australia, but no point ruining his worldview of kangaroos hopping around where the hills are alive with the sound of music. He bought the cowboy wear at Big-Time Boots, just yards from the Elvis statue that’s near where he’s stopped. As are so many of the folks jamming this steamy downtown day in the tourist district, he’s here for the Titans game against the Philadelphia Eagles. As that turns out, of course, they returned with a feeling of real loss to the land of cheesesteaks and Rocky Balboa. Schmitt is here because his friends are Eagles fans. He’s a Vikings fan, so he’s hoping the Eagles will lose. Philly fan John Nester, 42, from Maryland, is in Big-Time Boots, amazed by the walls and shelves filled with selections and at least semi-determined to buy a pair as a souvenir of what will turn out to be a tragic football trip to Music City. While he goes off to look at the hats as well, one of his pals, Joseph Glincosky, from Kenilworth, Pennsylvania – “just say Philadelphia, ’cause no one will know Kennilworth” – also is considering a boot purchase. “We’ve been in Tootsie’s for a while and we had a couple of drinks, so this seems like the perfect time to do this,” he says, indicating he enjoyed that purple watering hole, a tourist attraction that seems to be a must stop for all Eagles fans and other lovable losers and no-account boozers on this day. He adds he doesn’t mind being referred to as “Black Beard” for his bounteous facial hair, and he’s looking for one particular type of boot. 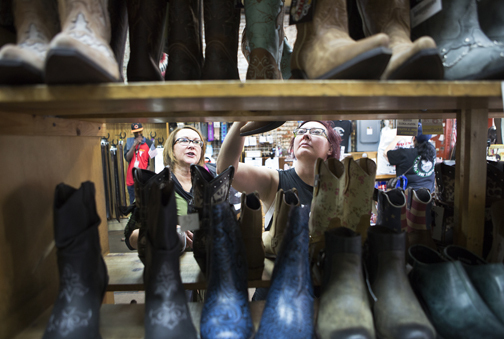 Paula Duval, left, of North Dakota and her niece, Michelle Stephens of South Dakota, check out the boots in Boot Country. “I want to get snakeskin, like Morrison wore when he had on those black leather pants,” explains the 40-year-old who was seven years shy of conception when Doors’ bandleader Jim Morrison checked out of Morrison Hotel for the final time, his bloated body found in the bathtub of his Paris apartment. Black Beard Joe reaches for a pair of women’s boots that are on display. “I might buy these for my old lady,” he says, reckoning his wife, Sasha, would love the blue color. “We love our wives,” adds Charlie Stewart, 40, from Gloucester, New Jersey. An industrial electrician by trade, he knows that Ariat makes good work boots, and is anxious to look at the brand’s cowboy boots. There apparently is one bachelor holdout, but he’s already headed for the door and the street that’s filled with “country” music, like Joe Walsh’s “Life’s Been Good” and something else that sounds kind of like generic Eric Clapton… but not nearly as country. Juliette Mucci, 57, and her husband, Pat, 64, from Houston, are both in the transportation business and are in town for a meeting and for a private, backstage tour of the Grand Ole Opry that night. That issue is in the process of being resolved, of course. Pat’s not quite so bent on buying a pair, though he’s not ruling it out. Ready for step up? How about $2,600 for water buffalo? Amanda Wright, 20, from Birmingham, Michigan, is on “a girls trip meet-up in Nashville,” in which all her old chumettes have gathered for the well-publicized, loud (sometimes lewd) fun that city fathers peddle to tourists. Her friends are from Connecticut, Texas, Florida and New York City. 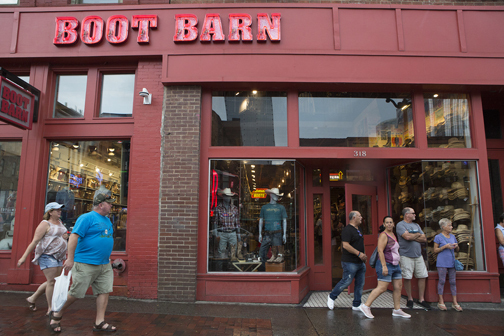 She’s looking at a pair of $175 Dan Posts during a drop-in visit to the Boot Barn. “I really like them,” she acknowledges. “I have been wanting a pair to wear out tonight” when the young women pay a return visit to Lower Broadway after going back to their hotel to dab off the afternoon sweat, re-energize with a cocktail and then re-makeup. He’d like some with steel toes. Regardless of whether he buys any, he knows what’s on his agenda the rest of the day: “Drinking with a lot of Philly fans.” Perhaps that’s the reason for the steel toes? Hair of the dog is an obvious pre-game menu item for the next morning. There is a chance she’ll buy both. “Boots are very comfortable,” she says, noting this is her second trip to Nashville. “Up in Toronto we call it NashVegas. …Cowboy boots are unique and they are fun.” She says she’ll wear her purchase to the Calgary Stampede. Over at Boot Country, a few steps down the street, long-haul trucker Chris McDannald, 57, and his wife, Bev, 62, both are trying on boots, hoping to take advantage of the buy-one, get-two-free pricing. The two live in Seymour, Iowa, and Bev only joins Chris when he is going places – like Nashville – that she’d like to see. Chris is determined to find two pair, and he already has his favorites – so far – stashed next to the bench where Bev is trying on her choice. The boots are his regular footwear during his long hauls and he’s already got two pair in the truck – he and Bev are sleeping in their rig parked at the TA on First Street. “Got four other pair at home,” he says, adding that he is inspired by the country music he enjoys listening to while driving down the long and lonesome highway. “I really like Blake (Shelton). He just has attitude,” Chris says. A woman, bra tattooed on beneath an almost-invisible top, happily hellos fellow tourists as she passes the doorway on Lower Broad.